If I am not mistaken, this is Higgs Raccoon's 100th story posted to Flayrah (and he did it without resorting to copy-and-pasting Newsbytes and Previews, too), so congratulations to Higgs! Welcome to the 100+ club; club members are entitled to ABSOLUTELY NOTHING, and maybe bragging rights. Maybe. I think it takes a while for that to update; if you look at the sidebar, it says I only have 17 stories before July 16, when I have 18 (I'm a bit obsessive about this stuff). Besides, you were at 99 before this story was published; I was keeping track. Trust me, you're at 100. This is my part of the world and I ran into a couple of the Gromits whilst they were on display around the city. For friends with kids, this has been - in some cases - a lengthy adventure. 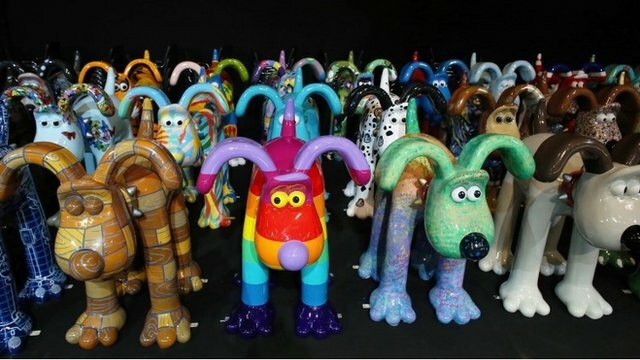 Over several visits they've toured around the place visiting every Gromit and checking them off as they go. "Gromithunting", I've heard it called, and quite an expedition it was if you were going to check off every last one. Near to Bristol, the city of Bath has displayed series of decorated lion and pig statues in recent years. Not as much fun as these, though! Adding to Allicorn and Anon's comments above, in Liverpool they had decorated Superlambananas, and Chester had decorated Rhinos.